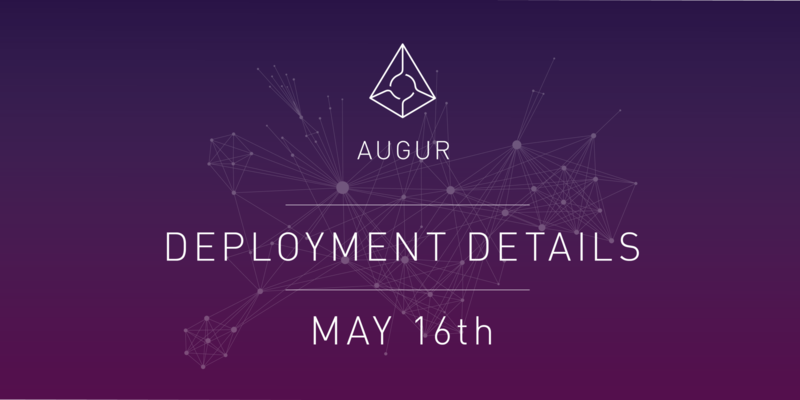 Our timeline has solidified internally, and we’re are ready to share some details surrounding Augur’s deployment. When Augur is deployed, all current REP token balances must be migrated to a new REP token contract, which will exist within the genesis Augur universe. This process will be similar to when we migrated REP previously; however, this time under better circumstances! Augur’s contracts will be deployed to the main Ethereum network and the REP migration will begin on July 9th, 2018 at 18:01 UTC (11:01AM PDT). On July 9th, 2018 at 18:01 UTC (11:01AM PDT), the current REP token contract will be frozen indefinitely, and the automatic migration of REP balances will begin. If you are a REP holder or user of a centralized exchange or non-custodial decentralized exchange, there is nothing you need to do. In the specific case of custodial decentralized exchanges such as EtherDelta/ForkDelta, IDEX and OasisDEX, users must withdraw their REP from the exchange contract prior to July 9th, 2018 to have their balances properly migrated. Users of non-custodial decentralized exchanges (such as Paradex, RadarRelay, and other 0x Relayers) and centralized exchanges (such as Bittrex, Poloniex, and Kraken) do not need to do anything. Individual REP token holders also do not need to do anything: once the REP migration is complete, your REP balance will be exactly as it was before the migration. The migration should only take a few hours, assuming all goes well. After the current REP contract is frozen, and the balances and approvals have been migrated to the new REP contract, every service that touches REP will need to update the contract address. Once Augur is deployed and the REP balances have been successfully migrated, Augur will be live on the main Ethereum network. Further details on the deployment procedure and REP migration will be released over the coming weeks. We are still looking for people to stress test the UI, look for bugs in our code, and generally break Augur any way they can. All feedback can be reported in Discord or at bounty@augur.net. We will be demoing the Augur UI and all its functionality this Friday at 2PM PST in the Gitcoin Community Call Live Stream. Come drop in if you want to see the demo! The bounty program is rolling and accepting all submissions. Test out the UI at dev.augur.net, take a look at our Github, and let us know your feedback! Come chat with us in Discord and follow our Twitter for the latest updates. Track our development progress on Github or in the #dev channel of Discord.